lication Date: June 3, 2010 A deeply personal memoir of the private Ray Charles - the man behind the legend - by his eldest son. Ray Charles is an American music legend. A multiple Grammy Award-winning composer, pianist, and singer with an inimitable vocal style and a catalog of hits including "What I Say," "Georgia on My Mind," "Unchain My Heart," "I Can't Stop Loving You," and "America the Beautiful," Ray Charles's music is loved by fans around the world. Now his eldest son, Ray Charles Robinson Jr., shares an intimate glimpse of the man behind the music, with never-before-told stories. Going beyond the fame, the concerts, and the tours, Ray Jr. opens the doors of his family home and reveals their private lives with fondness and frankness. He shares his father's grief and guilt over his little brother's death at the age of five — as well of moments of personal joy, like watching his father run his hands over the Christmas presents under their tree while singing softly to himself. He tells of how Ray overcame the challenges of being blind, even driving cars, riding a Vespa, and flying his own plane. And, in gripping detail, he reveals how as a six-year-old boy he saved his father's life one harrowing night. Ray Jr. writes honestly about the painful facts of the addiction that nearly destroyed his father's life. His father's struggles with heroin addiction, his arrests, and how he ultimately kicked the drug cold turkey are presented in unflinching detail. Ray Jr. also shares openly about how, as an adult, he fell victim to the same temptations that plagued his father. He paints a compassionate portrait of his mother, Della, whose amazing voice as a gospel singer first attracted Ray Charles. Though her husband's drug use, his womanizing, and the paternity suits leveled against him constantly threatened the stability of the Robinson home, Della exhibited incredible resilience and inner strength. 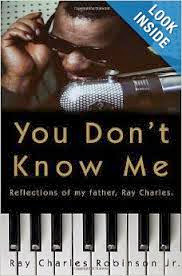 Told with deep love and fearless candor, You Don't Know Me is the powerful and poignant story of the Ray Charles the public never saw — the father and husband and fascinating human being who also happened to be one of the greatest musicians of all time. From the Hardcover edition.